The most listings. We’re Australia’s largest drone jobs marketplace & our service is 100% free. Get aerial photography quotes usually in under 1 hour from 1000+ listed drone pilots nationwide. 0% commission. We keep drone photography prices low by not charging the drone pilots a commission when you pay them to do a job. We are also fully independent. You stay in control. 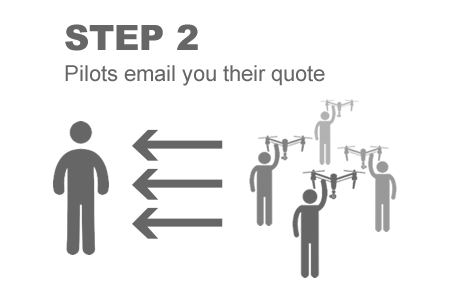 After you send an enquiry you are free to contact the drone pilots directly via your normal email or by phone – the process is simple & fast. Drone pilots await your enquiry to get aerial photography of a house, an event, construction site or aerial survey. 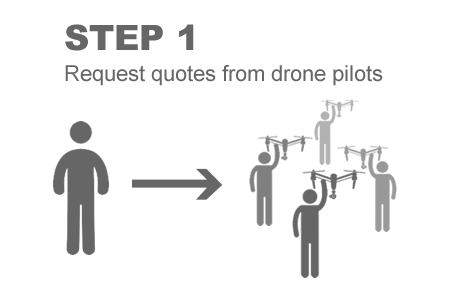 Submit an inquiry to multiple drone pilots and expect quotes about 1 hour or less! "Fantastic service. Drones for Hire helped me find a drone pilot within a tight time frame. I found a great operator and couldn't have got it all done without this website/service." "Amazing service! Super easy and super quick. I found the prefect operator for my project! They also provide you with tips on how to chose the right operator for your individual needs. This was so helpful for someone without any experience in this area. Thanks!" "I was looking to get my RePL and couldn't find anyone doing the course closer than 2+ hours to me. Drones For Hire facilitated finding me the right fit and followed up to make sure everything worked out. They seriously went above and beyond. Great service." "These guys are really good and helped me find a drone course right near where I live. Definitely recommend them for any drone related enquiries. Another benefit is they have put me in touch with a drone company that can give me more work too. Another added bonus A+++ great work team!" "Amazing responses!! It has been very effective in getting back a selection of quality quotes in a very very short timeframe, with personal responses and accurate pricing and questions coming back to me. I have been quite amazed and only wish there was this kind of service for other suppliers!" "Service was great, we received contact promptly from 3 suppliers"
"We run a metaliferous mine and required a drone to measure the volume of a large space underground. We received various responses and overall the process was easy and the service was excellent"
"To only have to go to one website was very helpful. I was contacted within 15 mins of sending my inquiry and found the right drone operator very quickly - a great service"